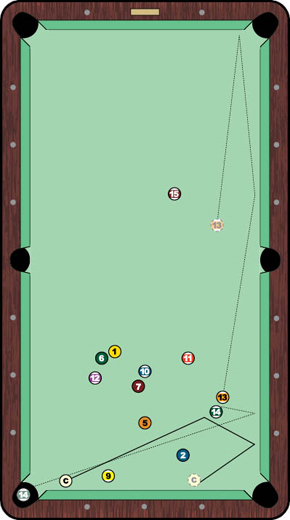 In 9-ball, your choices are pretty limited - one ball and maybe a pocket or two to choose as its final destination. Try straight pool, and you've got all six pockets for all fifteen balls. Plenty of options. But when it comes to shots that'll make you pull of a double or triple take, take a look at one-pocket. Sure, you're restricted to a single destination, but there are a near-infinite number of possibilities to coax a ball back to your hole. Take Francisco Bustamante's effort in one-pocket division at the 2011 Derby City Classic as proof. In his seventh-round best-of-3 match with Richie Richeson, the Filipino Hall of Famer was facing a difficult situation. Not necessarily the most well-studied in the discipline, Bustamante was trailing the more seasoned one-holer in Richeson, 2-1. He was also down in the game, three balls to nil. Richeson, who had the bottom right pocket, played safe by banking the 13 ball into the stack and tucking the cue ball on the foot rail near the 9. But the 13 rolled up near the 14 just off the long rail. Innocuous enough - unless you're facing one of the greatest shot-makers of all time. Bustamante took all of 10 seconds to line up the shot in the diagram. Just barely squeaking the cue ball past the 9, Bustamante sent the 14 into the 13 and off the long rail on its way back to his hole. An unbelievable option few could've seen, the shot also left the Filipino with perfect position on the 9 ball to continue his run. Alas, Richeson rebounded to take the game and the set. But when it comes to remarkable creativity and ridiculous precision, it's tough to top this little dandy.